The Back 2 School Giveaway is back and once again this year, bigger than ever! Every year, there are children in our community that show up to school on the first day unprepared to start the school year. We want to make that happen a whole lot less. 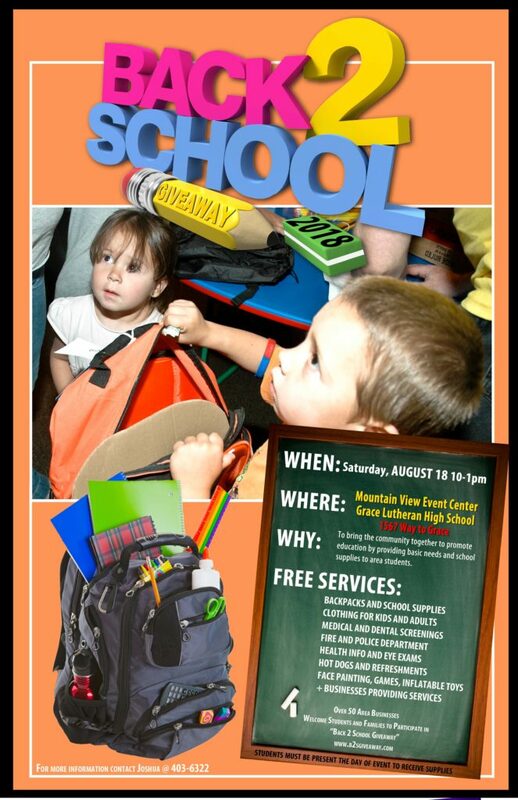 If you or a family you know are in a pinch this year and need some help with school supplies for the 2018-2019 school year, please plan to join us on August 18th at out to Mountain View Event Center (1567 Way To Grace Ave. in Pocatello – off Olympus Drive next to the Grace Lutheran School and church) for the 2018 Back 2 School Backpack Giveaway! Last year, nearly 2000 students received a backpack full of the school supplies they need to succeed in the new school year! Additionally, 5500 people were in attendance, 600-800 people came just to enjoy the “fair” services, there were over 250 volunteers, over 100 amazing businesses donated, sponsored, or served Back 2 School, over 2000 bags of clothes were given away! This year, there’s a new location and in addition to the backpacks, there will be a lot of other stuff going on throughout the day as well. Take a look! The event runs from 10am to 1pm and is primarily for grade school students in need, but there will be supplies for Jr. High and Sr. High students as well. For more details and information, visit the event’s official website here. Thanks to all the wonderful sponsors that have stepped up to help this wonderful event!